Some girls have a closet full of purses or a shelf full of shoes. My favorite fashion accessory happens to be frames. This girl loves her glasses – especially if they're bold, colorful, and fabulous. 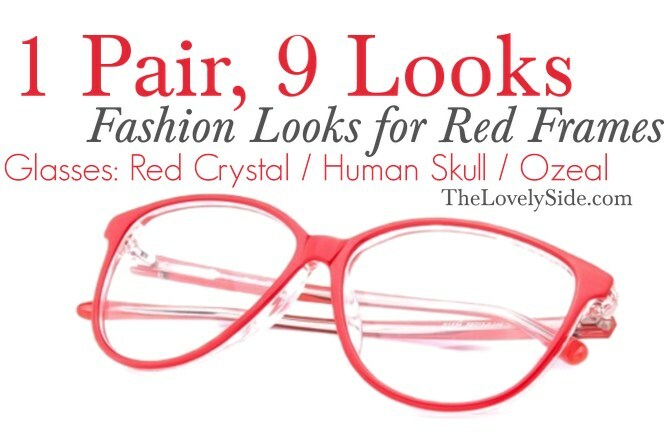 Like the Human Skull Red Crystal Glasses from Ozeal. This pair of red hot frames is my new favorite. A vibrant pair of specs can seem like a challenge to style – and the red gets me quite a few Sally Jessy Raphael references – but I've been having a lot of fun styling them with different outfits for both work and play. But first, a quick history and review of the glasses. Ozeal Glasses is one of the top online glasses shops in the world. They sell top quality, reasonably priced glasses in over a thousand statement-making styles. From trendy to classic, there's something at Ozeal for every four-eyed lady or gentleman. When it comes to fashion, four eyes really can be better than two. Since I have black, clear, and tortoise glasses, I wanted to something a bit more fun – and a lot more daring. I chose the Human Skull Red Crystal pair because they're big, beautiful, and bright cherry red. They arrived quickly and in perfect condition. As soon as I picked them up and put them on my face, I could sense the quality. Plus, they're the most comfortable, face-fitting pair of specs I've worn. 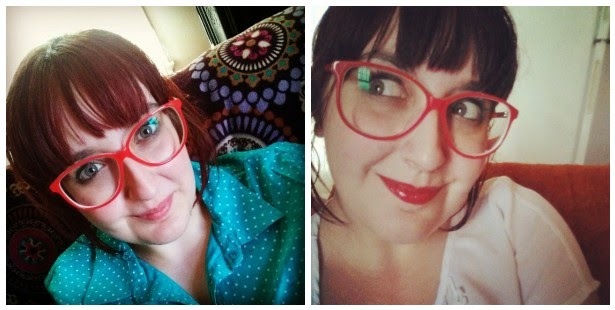 My favorite way to style my new red glasses is pairing them with patterned neutrals. Neutrals like ivory, beige, brown, black, white, and ivory really allow for the red glasses to pop, while gingham, polka dots, snakeskin, and stripes add some graphic personality. For a weekend hopping from pubs to antique shops, a pair of red skinnies, black and white gingham shirt, and loafers feel comfortable and cute with my red glasses. In the office, the glasses add class and a bit of geek-chic to brown trousers, black flats, and a polka dotted blouse. And for a night out, simple stripes and sassy snakeskin flats get gussied up with the red glasses. For an extra punch of glam, I slick on some red lipstick to match. Chambray and denim are springtime go-to's for me. I love dressing the blue fabrics up for work or down for the weekend. Since chambray and denim are pretty much neutrals, they're both perfect backdrops for a bright burst of color like my red frames. For a daytrip to a nearby brewery, I like pairing dark denim boyfriend jeans with a light chambray blouse – completing the look with brown leather flats and my red glasses for a pop of cherry. In the workplace, a denim blouse looks feminine and pulled together with denim flats and a pleated gray skirt – providing the perfect neutral background to let my glasses take center-stage. And for a casual date night with the boyfriend, a summery chambray dress under a darker denim jacket looks adorable with red flats that match my red frames. When I'm feeling my most daring self, I pair my bright red glasses with equally bright hues. These looks are not for the faint of heart! For a fun night of craft beer and friends downtown, gray skinnies and black flats take a backseat to a neon yellow tee and red hot frames. Sometimes I crave an all-crimson look. So I pair the red pair with red flats, a flowy red blouse, and patterned denim for a casual office outfit. And I adore a scarlet / turquoise combination. For a fancy dinner with the man, white hot skinnies and red hot frames get a refreshing splash of tropical teal with a blue-green blouse and flats. Head over to Ozeal now and let me know which pair of eyeglasses is your favorite – and how you'd style them for work or play.